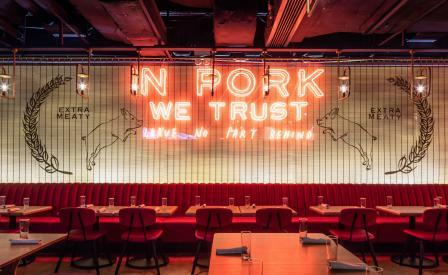 If you didn’t know any better, you’d think that Tom Aikens is bent on building a rather tasty mid- and far-east culinary empire. Fresh off the opening of Pots, Pans & Boards in Dubai, the Brit chef has popped up again in Hong Kong. His newest restaurant The Fat Pig is his second collaboration with local F&B heavyweight, Press Room Group following the wildly successful The Pawn. This time round, the Michelin-starred alum has put pork front and centre of the menu, specifically meat sourced from a farm in the New Territories. Yes, the conceit of ear-to-tail dining takes its cue from Fergus Henderson’s St. John in London, but the porcine focus is genius given the Chinese fondness for the animal. At The Fat Pig, Aikens freestyles between east and west to create such charmers as pork rillettes with sour apple chutney, deep fried pig’s ears with green caper sauce, and chopped pig’s trotters on sourdough. ’I want to encourage less-adventurous diners to try cuts they’ve never had before,’ he says. Long-time collaborators, London-based Michaelis Boyd Associates have been tapped to work on the interiors, creating a mood-lit clubby space filled with leather banquettes, and globed chandeliers. On smog-free days, the outdoor timber-decked terrace is just the ideal pre-prandial spot for some satisfyingly crunchy pork scratchings and beer.